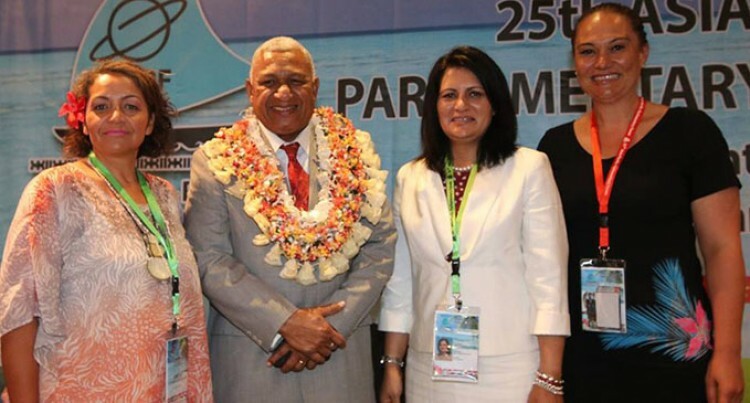 From left: Co-Leader of the Maori Party, Marama Fox, Prime Minister Voreqe Bainimarama with other participants at the 25th Asia-Pacific Parliamentary Forum at the InterContinental Fiji Golf Resort and Spa, Natadola. Photo: DEPTFO News. Fiji can expect New Zealand’s support in its presidency of COP23. NZ is currently considering how it will further support Fiji to combat global climate issues. The assurance was given by a member of NZ’s delegation at the 25th Asia-Pacific Parliamentary Forum at the InterContinental Fiji Golf Resort and Spa, Natadola. The Co-Leader of the Maori Party, Marama Fox, made the statement during her presentation. She said this was the first time that a small Pacific nation would hold a COP presidency. “Who else but an isle of the Pacific should carry out this role? The 23rd session of the Conference of the Parties (COP 23) to the UN Convention on Climate Change (UNFCCC) will be organized by Fiji and hosted at the headquarters of the UNFCCC Secretariat in Bonn, Germany. COP is the governing body of an international convention. Of the numerous official bodies and officers that provide for the governance of Conference of the Parties (COP) meetings, the most important of these is the President. Prime Minister Voreqe Bainimarama is president of COP23. Ms Fox added that no other nation of the world faced the real threat of becoming stateless through sea level rise. She presented on climate change and its adverse and visible impacts on the Pacific island nations. She said one was quick to talk about globalisation but biggest polluters of the world did little to stem the contamination of world’s atmosphere for fear of reduced profits. Ms Fox said Tuvalu, Tokelau, Kiribati and many other Pacific islands faced the real threat of becoming landless. Global Climate Change had seen the rise of the oceans impact on costal erosion, and inundation of land. Islands face the threat of reduced fresh water sources with sea water claiming island aquifers. The rise in ground temperature threatens the aquifers of the world with only an estimated 20% of rainfall making it through the natural pathways to replenish aquifers; water has become the blue gold of the new millennium. She said New Zealand ratified the Paris Agreement in October 2016. The country had been active in international negotiations to develop the Paris ‘rule book’ and on international aviation emissions, she said. New Zealand’s commitment of up to $200 million in climate related support to developing countries would be provided before the Agreement takes effect.